It was a rainy day today after a beautiful weekend. I decided to go back to Valley Forge and see if I could find my hawk. And lo and behold, there in the field at the edge of the woods was a lone hawk sitting in the grass waiting for his breakfast to appear. The following pictures - after this blog posting - give you a quick view of my friend searching and finding a snake, and then then after a few minutes, taking off with the snake in his mouth. 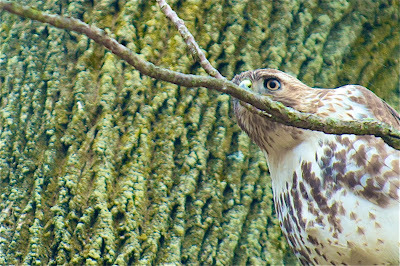 The first photo is the hawk in a tree where he perched for a little while looking for movement in the grass. He was totally aware of me, but didn't seem to care if I was there or not. So much fun. Click on any of the photos to get a better view.